'Welfare dependants' (people who relied on welfare for most of the last decade) make up 0.3% of welfare recipients. The portion of Australians on welfare today is the lowest it has been in 20 years. Out of 30 OECD Countries Australia ranks 25th for welfare spending. The Newstart allowance has not increased in real terms in over 2 decades. In 1997 MPs salaries were twice the average wage, today they are 3 times the average wage. MP’s claimed a total of over 8000 years’ worth of Newstart allowance in 2016. The minister responsible for welfare at that time, Alan Tudge, claimed the equivalent of 39 years’ worth of Newstart payments. In 2016 Tony Abbott's expense claims were the equivalent of more than 37 years’ worth of Newstart payments, Peter Dutton's were more than 55 years’ worth, Scott Morrison more than 61 years’ worth and Malcolm Turnbull more than 105 years’ worth! The biggest claimant for 2016 was Julie Bishop with nearly 113 years’ worth of Newstart payments. Bear in mind, these are expense claims only, they do not include salaries and other allowances. That year Andrew Robb, the former Trade minister, walked into an $800,000 a year job with a Chinese company for whom he had previously approved a 99-year lease on Darwin Port. Robb claimed 38.5 years’ worth of Newstart allowance in 2016. He resigned from Parliament mid-February that year! According to 2014/15 tax estimates, negative gearing costs more than $3.6 billion a year in lost revenue. That's about as the same as the government spends on assistance to jobseekers and vocational training, and twice what it spends on assistance to Indigenous Australians. Federal MPs own 524 properties. Most of them are negatively geared. It costs the equivalent of 156.75 years’ worth of Newstart payments to maintain a single federal MP for one year. In 2015/16 our 226 Federal MPs cost us the equivalent of 36,120 people on Newstart. Also in 2015/16, the estimated cost of tax evasion in Australia was the equivalent of nearly 400,000 years’ worth of Newstart payments. The fossil fuel industry in Australia receives the equivalent of more than 350,000 years’ worth of Newstart payments in annual subsidies. 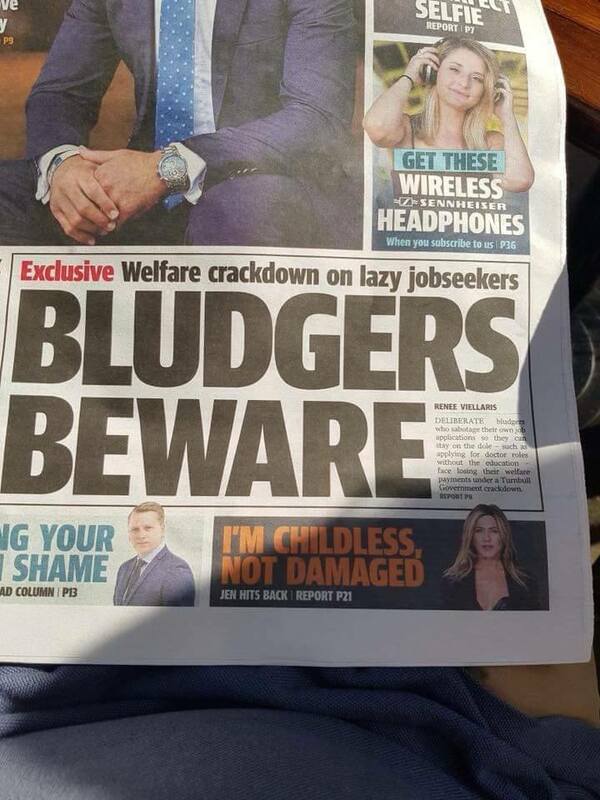 In 2015 it was estimated that Rupert Murdoch’s US media holdings had siphoned off more than 321,226 years’ worth of Newstart allowance from his Australian media businesses virtually tax free. Commenting on this Blog entry will be automatically closed on October 3, 2018.